1967 was the 700th anniversary of the granting of a Royal Charter. 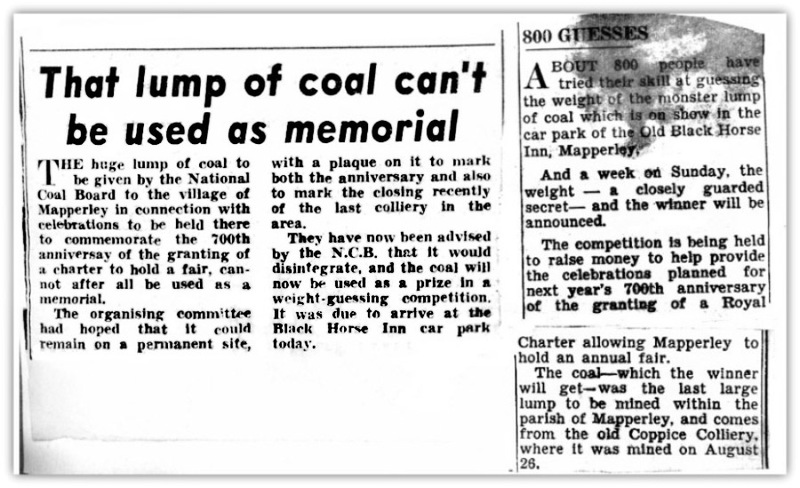 The Coal Board presented the village in 1966 the very last lump of coal to be mined in the parish. This was placed on The Black Horse car park. 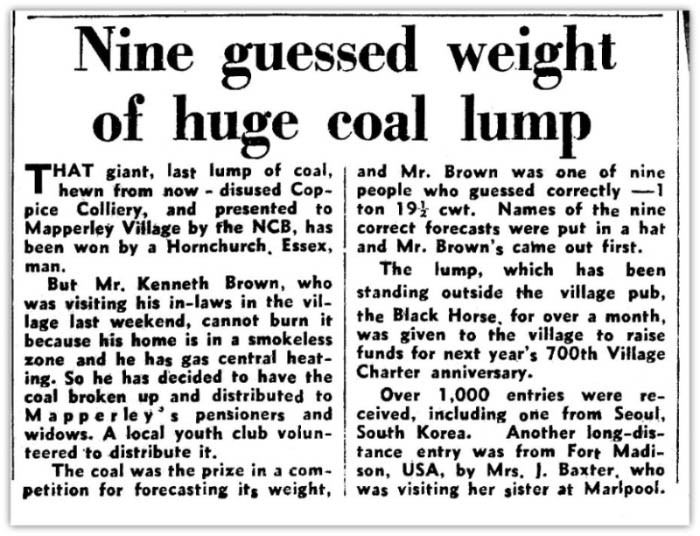 At 1/- (shilling) a time the public were invited to guess the weight. 6 guessed correctly at 1 ton 19 cwts 56 lbs. Its actual size being 9ft high by 5ft wide and 3” thick. 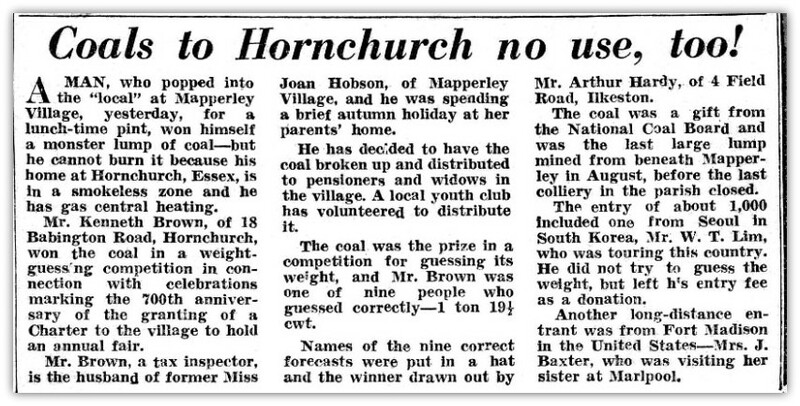 The winner donated the coal to the pensioners of the village. THE rain came down at Mapperley on Saturday afternoon, but even though the grass was dampened, the spirits of many local people were not, and a large crowd assembled around the village church gates to hear Captain P. J. B. Drury-Lowe announce the Village Fair open from the comparative shelter of his umbrella. The occasion was the celebration of the 700th anniversary of the granting of a Royal Charter to hold a fair and market in the village. In his opening speech Captain Drury-Lowe said that it was difficult to say when his family first held property in the area but it was believed to be in the nineteenth century. He added that the family now owned about 240 acres of land in the village. He said that in, the early days of the Drury-Lowe connection with Mapperley the village was part of the parish of Kirk Hallam. Mr, Hobson, one of Mapperley's oldest residents, thanked the organising committee of the fair for their efforts. A deer, contributed by the Drury-Lowe estate, was given to the fair for roasting. Prepared by a local butcher, Mr. George Stafford, it was carved and put in rolls for hungry venison fanciers. 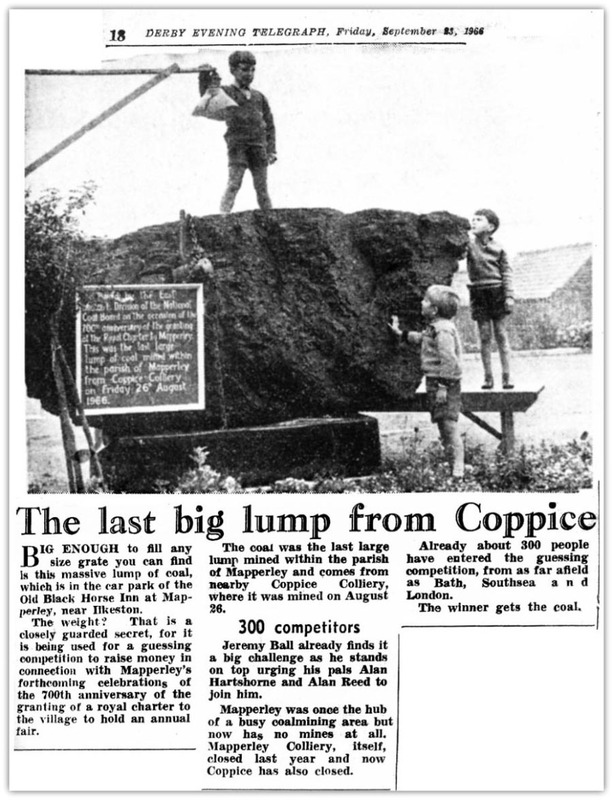 The village stocks, the unveiling of which was one of the highlights of the fair, were constructed in a base of concrete by a local builder. They are made of teak and bear a brass plate commemorating the occasion. During the afternoon a fancy dress competition was held with cash prizes. Winner in the under-five age group was Sarah Shooter as Simons of Arderne. In the five to sixteen age group the winners were jointly David Clay and Ann Smith as a King and Queen. Mrs. Vera Powell, president of Mapperley Women's Institute, took first prize in the adult section. A piano pushing race from Mapperley crossroads to the village was organised by the Ilkeston Drummond Scout Venture Unit. The result was a tie between the Ilkeston team and the Mapperley village team. Ten pianos were pushed in the race and upon arrival in the village competitors had to chop up their pianos and push them through old tyres set in the street outside the Black Horse. The race was started by ace wrestler Bert Royal. A tug-o'-war on Monday was also won by the Mapperley team. 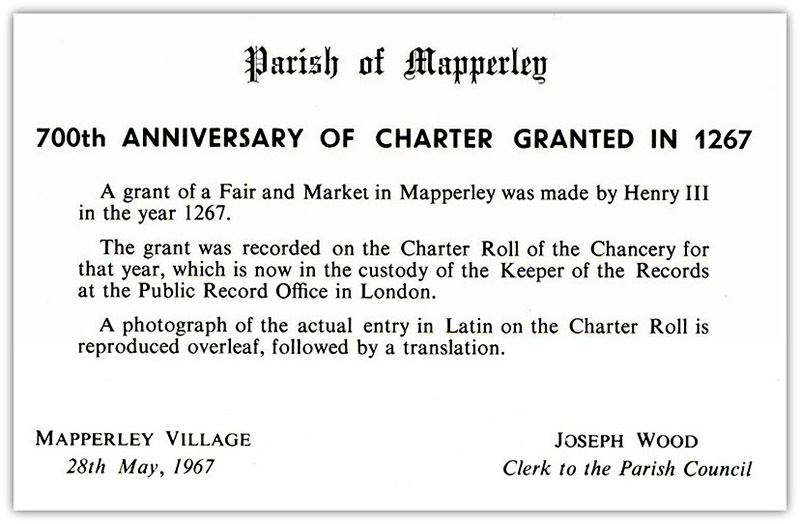 The historic Royal Charter was granted to Mapperley when Simone de Arderne was Lord of the Manor in 1267. Commented Mr. B. Skinner, a member of the organising committee "We were quite satisfied with things as they turned out despite the poor weather. We were lucky to have a large marquee where all the events took place under cover." Mr. Skinner observed from comments that had been made that it had gone down well with those who had paid a visit to the fair and they had not gone away disappointed. Mick McGill, David Moss, Aubrey Marsden, Robert Hawley, Pete Heywood. Cyril Hartshore, Michael? McRitchie, Tony Webster, Roger Pritchard, Gladys Webster, Mary Hawley, Margaret Isam, Maureen Isam. Joyce Richardson, Linda James (Moss), Harriet Riley, Margaret Haynes, Maureen Hornby, Elaine Richardson (Sarson), Jean Marsden, Mollie Skinner. 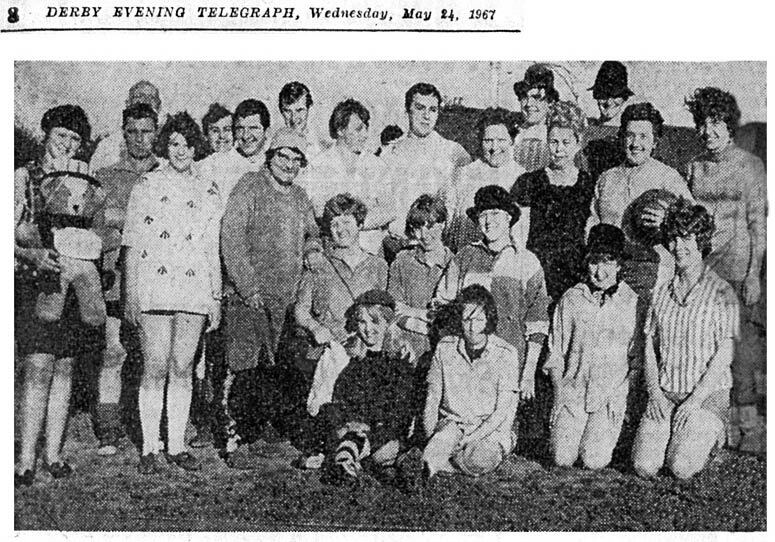 Mapperley celebrations, marking the 700th aniversary of the granting of a Royal charter allowing the village to have a fair kicked off to good start last night when a team of women from the village beat a team of men 6-5 in a fun parked foot ball match on the Mapperley M.W. ground. The women were leading 6 – 3 five minutes from the end and then the men turned their attention from their glamorous opponents and settled down to some attacking football. Referee was Mr. B. Skinner, secretary of the committee organising the celebrations. The teams are pictured before the kick-off. Then went with a bang. In fact, lots of bangs….and the lightening flashed and the thunder rolled and the rain sheeted down, up went the brollies and those little fold-away plastic hoods. A few plastic bags that had once sheltered cakes and such like were pressed into service. The Vicar nicked his son’s ‘genuine panama’ and vowed that the rain was all in the mind!. The sun didn’t smile, but the people did. We are an odd race. When we put our mind to something hell or high water does not deter us. We were determined to enjoy ourselves. As Bert Royal (the wrestler) put it. “A great day”. The Morris Men performed – made you sweat just watching. But what a cheerful bunch. Pretty fit too. And the piano race was a smashing affair. One chap was so keen that he finished up with his arm in a sling. And asked why he was helping to sweep up afterwards (one- handed) he replied “Well we all might as well help” I think perhaps that summed up the spirit of the helpers and performers. But all sorts of things pleased all sorts of people. One lady was in her seventh heaven. “I’ve got Bert Royal’s autograph” was all that you could get out of her. Another lady’s day was made when Captain Drury–Lowe allowed to sit in his Rolls. We could possibly plant rice in the car park. The Vicar gave a hand with the ploughing – got stuck, even with Town & Country tyres on the back! Didn’t you notice that blue cloud hovering for a while? One of the Archers came to his assistance. Vicar’s not sure whether it was Dan or Philip!. Time passed. Rain fell. One or two clay pigeons got away. And praise be for the marquee and the clean straw provided. The venison rolls were great. And as for that barrel – pardon me whilst I make special noises (smacking of lips and appreciative sighs heard) – a drop of good stuff that! So we must depart, And we go with music in our ears – the silver band at one end of the marquee and the Group at the other. There was something for everyone. It was a right good do. So, thank you all, you who worked to make it such a success. Thank you.